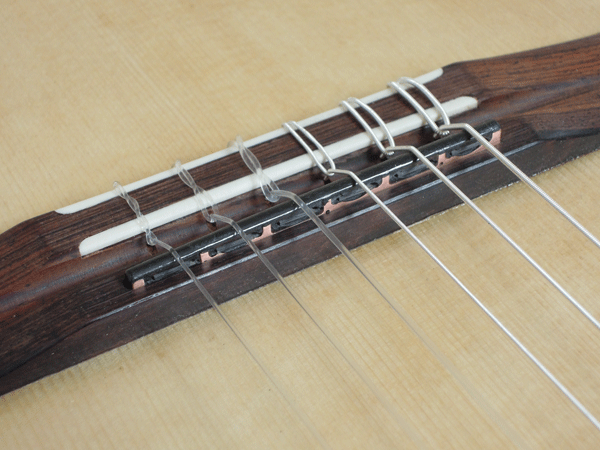 The Integrated Saddle Pickup is an invention of Rich Barbera of Barbera Tansducer Systems which picks up the vibrations of the string (Nylon or steel) with unsurpassed fidelity. It is installed in place of the usual bone saddle and does not interfere with the acoustic sound of the guitar even when the pickup is not connected to an amplifier. I have built one guitar with this saddle and was very impressed with the quality of the amplified sound and by the natural sound when not connected. I can include the Integrated Saddle Pickup in a new custom guitar if desired. I can also modify an existing guitar to include the saddle if the bridge construction permits it. Please contact me if interested.